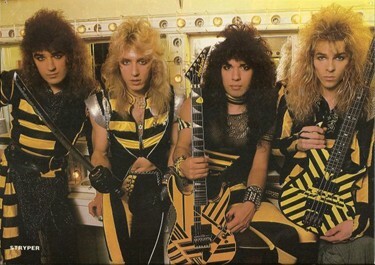 Stryper is the best selling Christian rock band of all-time and they have the gold and platinum records to prove it. Their biggest selling albums to date are 1986’s To Hell With The Devil and the follow up, 1988’s In God We Trust. Stryper was originally formed in Southern California by brothers Michael Sweet (singer/guitarist) and Robert Sweet (drums) who then enlisted the services of Tim Gaines (bass) and Oz Fox (guitar). Stryper gigged around So Cal and developed a loyal following — quite a feat for a band that was lumped in with the ‘hair bands’ of the day but who also proudly proclaimed their faith in song. If the songwriting and the musicianship wasn’t there they would have been gone as quickly as they appeared, but with songs like the MTV hit singles/videos “Calling On You,” “Free,” and “Honestly” Stryper broke into the mainstream. 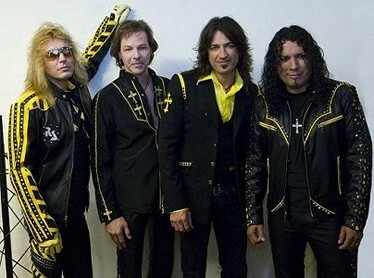 Stryper held onto that momentum until they changed the formula — gone was the yellow and black stage attire, and while the songs kept their faith values intact on the Tom Werman produced Against The Law, the album was met with a lukewarm reception by their core audience and critics, though it did spawn a couple of moderate hits in “Lady” and their cover of Earth, Wind and Fire’s “Shining Star.” The band went their separate ways afterward and Michael forged ahead with his solo career while the other members flirted with other projects. 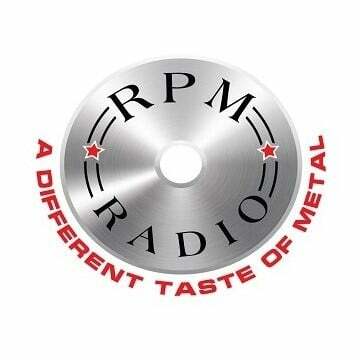 In 2005 Stryper regrouped and released Reborn followed by 2009’s Murder By Pride. In 2011 they bring us The Covering, where they tackle a dozen classic rock radio staples and a new original cut called “God.” Recently Sleaze Roxx spoke with Michael Sweet about the new album and Stryper’s upcoming tour that kicks off on March 2nd in Seattle, Washington. Sleaze Roxx: Michael, how long will you guys be touring behind The Covering? Michael Sweet: We kick things off in Seattle then we work our way down the West Coast and then we make our way to the East Coast. In total we have about 18 dates. Sleaze Roxx: You released The Covering, a collection of a dozen covers and a new studio track, on February 15th. How did you guys go about selecting the tracks that made it onto the album? Michael Sweet: It was simple because it was songs that we grew up on. There was no difficulty at all and the album came together fairly quickly. I presented a list of songs, a couple of additional suggestions were thrown in there by the rest of the guys in the band, and that was it — it was that simple. I felt that it was very important that we include a new song to solidify our faith and our beliefs — to show that we are still very serious about that. That’s how the song “God” wound up on there and, musically speaking, we also wanted to show people that we could still rock hard. Sleaze Roxx: The cutoff point on the covers recorded is 1983, which is when you formed Stryper. Was that intentional at all? Michael Sweet: That was just a coincidence, because those were the bands that helped shape our sound. 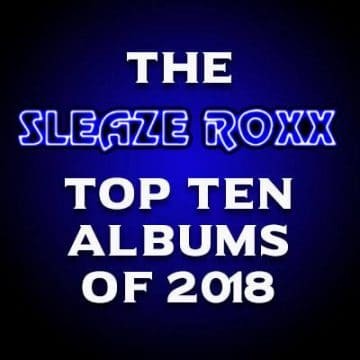 Sleaze Roxx: “Set Me Free,” “Lights Out,” “Heaven And Hell,” “Blackout”… there isn’t a clunker to be found on The Covering. The only song that I was willing to pass on was “Shout It Out Loud”, simply because I’m a huge KISS make-up era fan and I’ve played that to death — but I was pleasantly surprised at how well that turned out too. Michael Sweet: I’ll tell you, we went in there with the best intention of paying respect to the songs. At the same time we also wanted to add our spin to it. I have to add that the most important part of this album was how much fun we had making it. I think that energy shines through in the music. We accomplished what we set out to do, which was to pick some great songs and have a blast recording them. Sleaze Roxx: This album was cut in the studio, based on the liner notes. 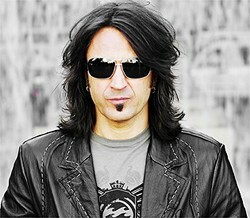 Michael Sweet: We went into the studio and banged out the basic tracks — drums, bass and guitars. We followed that up with guitar solo overdubs and then I went to my house and I did all the vocals, then we came back into the studio to mix it. There wasn’t any trickery — what you get is us in the studio jamming out the songs. Sleaze Roxx: The drumming on this is incredible, Robert (Sweet) doesn’t disappoint. I was also impressed with the guitar work on “Blackout,” “The Trooper,” “Breaking The Law,” and “Highway Star.” The guitars are just so tight and cohesive. Michael Sweet: Thank You. There are a couple of songs, “Over The Mountain” and “Highway Star”, which Oz (Fox) is soloing on. On “The Trooper” and “Blackout” that is Oz and myself doing the solos — I played the first half and then Oz came in for the second, and we end by doing the harmony on “The Trooper.” Oz and I love to play and we really complement one another. We’ve been playing together for years, though our styles are a little bit different. Sleaze Roxx: I have to compliment Tim (Gaines) for his work tackling Steve Harris on “The Trooper.” He pulled it off brilliantly. Michael Sweet: Right. You don’t realize how great those bands are until you’re playing the songs. Playing them in a live setting you can get away with some mistakes, but in the studio you can’t make any mistakes. That was one of those songs that really beat us up. It goes to show you just how incredibly talented Iron Maiden is, no question about it. Sleaze Roxx: You close the album with the original track “God” and you mentioned that you wanted to show people that you can still rock. Is this a result of Stryper trying to sound more contemporary with the last two albums Reborn and Murder By Pride? Michael Sweet: Not at all. I felt that it was important to have a new song that would be the boldest song that we’ve ever done in our career — both lyrically and musically. I wanted to solidify the fact that we are still completely serious about our faith, but at the same time serious about our fans. I think this is the kind of song that they’d like to hear. I know they want the harmony solos and the high screams that they’ve come to expect from a Stryper metal song. I think that “God” is where Stryper will be going in the future. The next album should be comprised of songs in the same vein as “God.” I think when we do that people are going to be very pleased with the outcome. Sleaze Roxx: It’s interesting that you say that, because a number of your contemporaries don’t feel the same about recording new music. Dee Snider, who I spoke to a while back, insists that fans don’t want to hear new music by bands from your era. He doesn’t discriminate, as he included Twisted Sister with the rest of the bunch. So you’ve never been reluctant to record new material? Sleaze Roxx: Why do you think the artwork for To Hell With The Devil was so controversial? It pales in comparison to the artwork found on Black Metal or Death Metal albums. Michael Sweet: I really don’t know. You’ve got to wonder why Stryper, over the years, have been so controversial. There is a pentagram on Satan’s necklace being torn off by an angel, but I tend to believe that even if there hadn’t been a pentagram on the cover people would have freaked out. It was unbelievable because we were being accused of not being a Christian band. People didn’t look at the complete picture, they didn’t read the lyrics, they didn’t get. People are closed minded — and that’s why the world is in the state that it is right now. Sleaze Roxx: One of the things that I saw regularly in Hit Parader Magazine back in the day was stories on Stryper vs. W.A.S.P. What did you make of those articles? That publication in particular entered the tabloid arena with not just you, but several bands. Michael Sweet: They were definitely about stirring the pot. People liked to stir the pot of the controversial band wagon. 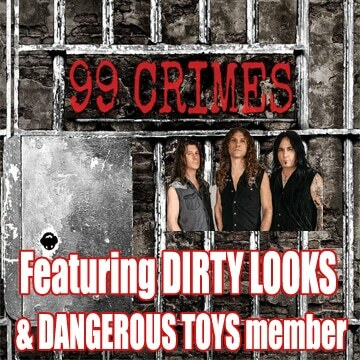 I remember the rumors and talk of ‘Heaven & Hell” tours with W.A.S.P. or with Motley Crue. None of those ever happened, but the funny thing is that, to this day, I have people coming up to me saying, ‘I saw you in ’89 with Motley Crue’ or ‘I saw you with W.A.S.P.’ — neither of those tours ever happened. Sleaze Roxx: It’s interesting that Blackie Lawless has become more spiritual throughout the years. I spoke to him about a year ago and he uses biblical references in his music and has stopped playing one of his signature and most controversial songs, “Animal”, in recent years. Some of his fans are giving him a hard time for pulling that song out of the set-list and it hasn’t been played in years. 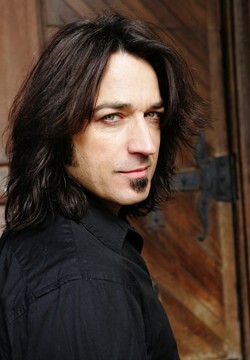 Michael Sweet: It’s amazing how people can be sometimes. I think it’s great that the guy found God. Blackie chooses not to do the song because he feels convicted by doing the song. That’s a stand-up guy — that’s honorable. You don’t slap someone on the wrists because he’s honorable. It’s amazing how people are, just because he’s not doing that controversial song that made him famous the guy is now a jerk? I don’t understand it. A true fan wouldn’t do that, a true fan would respect and honor it. I support it and applaud it. Michael Sweet: We wanted to get an incredible producer that would help us make an even more incredible album. We threw out a few ideas in a meeting with Tom and it turned out to be a good fit. I think the reason that record didn’t fare as well as the rest of the albums didn’t have anything to do with Against The Law — I truly believe that it had more to do with the timing. The industry was changing and it seems like it was overnight. The big thing was the Seattle sound and Nirvana, and Against The Law wasn’t that. It wasn’t just Stryper, it was a number of other bands as well. In retrospect I feel that if Against The Law was released in 1988 it would have been better received. Sleaze Roxx: Back to the present — what songs off The Covering will make it into the set? Michael Sweet: I can say that we are currently looking at doing four to five songs off The Covering live and we’ll be adding four Stryper songs that we haven’t done in the set for a while. This will be the longest set that we’ve ever done on a tour — it will be twenty-one songs. It’s pretty lengthy, I hope we can get through it night after night. Since most of the songs are in the upper register it can batter your vocal chords. I have to add that we’ll be rotating some of the covers every two to three nights just to keep it fresh. Sleaze Roxx: You’re still involved in the band Boston correct? Sleaze Roxx: What’s going on with them? I know you’ll be busy with Stryper for a few months but will there be a Boston tour or new music in the near future? Michael Sweet: There is a new album in the works. Tom Scholz (guitarist) has been working on one for a longtime. He’s talked about releasing an album at some point and then touring afterwards. There was talk of a 2011 tour but that didn’t materialize — it’s going to happen, it’s just a matter of when.